Three York-Adams pole vaulters qualified for the PIAA Championships. Greg Potter looked right at home in his first trip to the District 3 Championships, winning the Class AAA boys pole vault title on Friday. 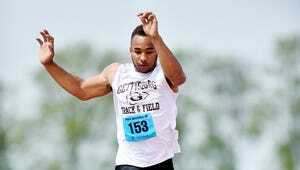 The Red Lion junior cleared 14 feet, 9 inches to add a district title to his quickly-growing list off accomplishments. He placed second at the Penn Relays last month and won the YAIAA title last week. Potter missed most of last season with a back injury, but has gained nearly four feet on his vault since this time last year by training at VaultWorX year round. His personal record is 15 feet, and he came close to clearing 15-3 late Friday. He'll have another shot at a new personal record at next week's PIAA Championships. Corbitt, Elliot medal in girls pole vault: Spring Grove's Nathalie Elliot landed in the pole vault pit, staring up a rattling bar. She breathed a big sigh of relief as that bar eventually came still and stayed put, giving her a personal record vault of 12 feet and securing her spot in next week's state championships. That vault earned Elliot a fourth-place medal and her first trip to the state championships, where she'll be joined by York Cunty Tech senior Lauren Corbitt. Corbitt, a York Catholic student who competes for the Spartans, also cleared 12 feet, earning her second place. Corbitt, a first-year pole vaulter, won the YAIAA title with a leap of 12-0.25 last week.